The best ever entry for the Porsche Carrera Cup GB has been unveiled today (Tuesday 22 March) during the championship’s pre-season test and media day at Snetterton. The entry for the coming season has both quality and quantity with more potential race winners than ever before, as an influx of new drivers join established aces like Tim Harvey (champion in 2008 and 2010), James Sutton (champion in 2007) and Michael Caine (runner-up in 2008 and 2010). The new season will feature the introduction of the latest model 911 GT3 Cup, with all drivers competing in identical models of the stunning 450bhp car. This is the fastest car ever seen in the Carrera Cup GB and will ensure that the championship retains its position as the fastest one-make category in Britain. Also new for 2011 is a race on the world-famous Nurburgring Nordschleife circuit in Germany on 25 June. The Carrera Cup GB racers will take part in the Porsche Carrera World Cup, an event that is designed to put as many as 200 911 GT3 Cup cars into action on the sensational 14-mile circuit in the Eifel Mountains. As well as the battle for overall glory, the contests in the Pro-Am1 and Pro-Am2 categories and the Team Championship will be major features of the season as drivers and teams battle for a total prize fund of over £160,000. In addition, the overall champion, the Pro-Am1 champion and the team manager of the champion team will have the use of a road-going Porsche 911 for a year. While Harvey, Caine and Sutton are the established benchmarks, at least six other drivers start the season with race wins in their sights. Harvey and Caine have teamed up at Motorbase Performance, while Sutton and Michael Meadows are in the SAS-backed squad at Red Line Racing. Another strong contender from the Red Line team is 2011 Carrera Cup Scholar Benji Hetherington, while the Team Parker Racing line-up has a new look this season with Richard Plant and Sam Tordoff to the fore. Other returning teams include Celtic Speed, with Rory Butcher as their young hotshot and Lithuania-based Juta Racing with Jonas Gelzinis set to challenge for race wins as he builds on the experience of last season. Among the Pro-Am1 and Pro-Am2 categories, a gaggle of rapid drivers will be challenging for the podiums with drivers like Ahmad Al Harthy, George Richardson, Steve Parish, Alex Martin, Andrew Shelley and series returnee Derek Pierce likely to battle for Pro-Am1. The Pro-Am2 field includes Celtic Speed duo George Brewster and Tommy Dreelan, Keith Webster, Tautvydas Barstys, Richard Denny and Swiss racer Daniele Perfetti. The action starts at Brands Hatch (Kent) over the weekend of 2/3 April when season nine of the Carrera Cup GB begins, running alongside the British Touring Car Championship. In June 2011 competitors in the Porsche Carrera Cup GB will take part in the Porsche Carrera World Cup, an incredible race on the famous Nordschleife circuit at the Nurburgring which will be contested by up to 200 911 GT3 Cup cars. The race, a round of the Carrera Cup GB, will run over six laps of the 14-mile circuit during the build up to the Nurburgring 24-hour race on Saturday 25 June. With a crowd of 250,000 fans expected, the race will make history as the biggest single-make race ever held. For the Carrera Cup GB drivers and teams the Porsche Carrera World Cup represents a chance to be part of a remarkable occasion and compete on what is widely regarded as the greatest race track in the world. 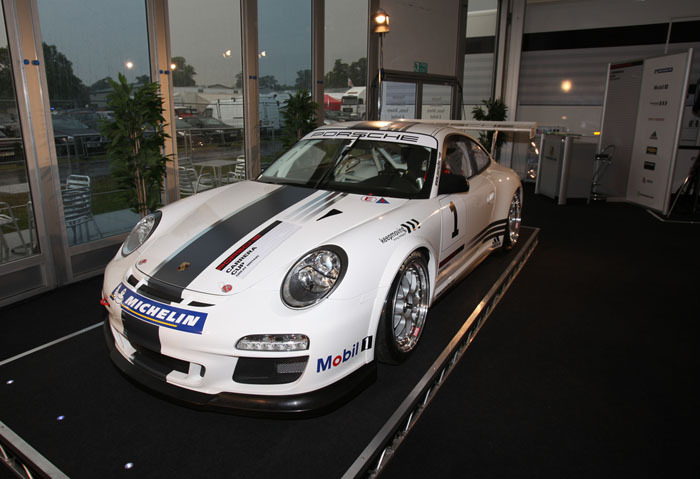 After a superb Carrera Cup GB season in 2010 with a capacity entry, the stage is set for an even better year in 2011.